AURORA ALERTS: Did you miss the Northern Lights of July 12th? Next time get a wake-up call from Space Weather PHONE. PARTIAL ECLIPSE, TOTAL FUN: This Friday, August 1st, millions of people in China will witness a well-publicized total eclipse of the sun. Less widely reported, however, is the partial eclipse, which billions of people across three continents can observe and enjoy. Fun tips and animated eclipse maps are available from Science@NASA: click here. 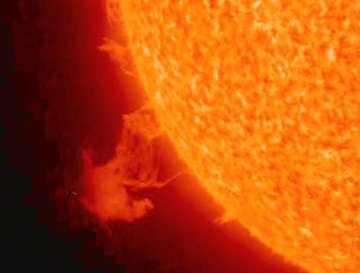 The movie spans a two day period, July 12-14, and shows a blob of gas five times the size of Earth being hurled away from the sun. Earth was not in the "line of fire" so no geomagnetic storms or auroras resulted from the blast. Astronomers on Earth witnessed only the upper regions of the explosion. From our point of view, the action took place over the sun's horizon. STEREO-B, however, has a different point of view. STEREO-B shares Earth's orbit around the sun (approximately), but lags behind Earth by about 30 degrees. This allows the spacecraft to see "around the bend," revealing solar activity hidden from terrestrial eyes. Seeing the hidden side of the sun is just one of many benefits of the ongoing STEREO mission; learn more from nasa.gov. This is no ordinary picture of the Milky Way; it's a doorway. Just knock and you'll be wafted away to a beach in the south of France with a dizzyingly beautiful galaxy arcing overhead. 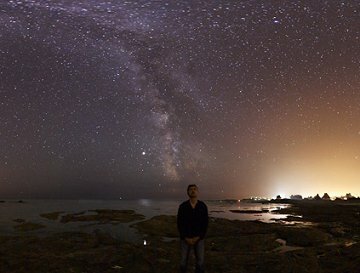 Photographer Laurent Laveder explains: "Two nights ago, I used a fisheye lens to take 16 individual pictures covering the entire sky. I then combined them to produce a Quicktime Virtual Reality view of the Milky Way." Tip: In the VR environment, look up and spin the Milky Way. You can make your own star trails. Don't go overboard, though; it can be disturbingly realistic. On July 30, 2008 , there were 964 potentially hazardous asteroids.